Fundraising practically makes you a superhero. Your team will have already chosen to raise funds for vital equipment, life changing services, or ground breaking research. Or perhaps you decided to leave it to the experts to spend it in the area that needs funds the most. But then the big question hits... how will I do this? Make a donation to yourself, then get your fingers running across your keyboard and tell your friends and family members all about what you are doing. Family and friends can easily help by sponsoring you, so make sure you send them an email with a link to your page to make it easy. Did you know that it only takes fundraisers on average 5 donations to reach their target? Share all your progress on social media. Don't forget to share photos, stories, videos, stats and stories. You've entered into this challenge for a reason so make sure you are letting your friends know how you are tracking along and what an easy way to do it. You will find friends who want to support who you may never have expected to! You might even get yourself a fan following. Give your colleagues extra inspiration to donate to you. 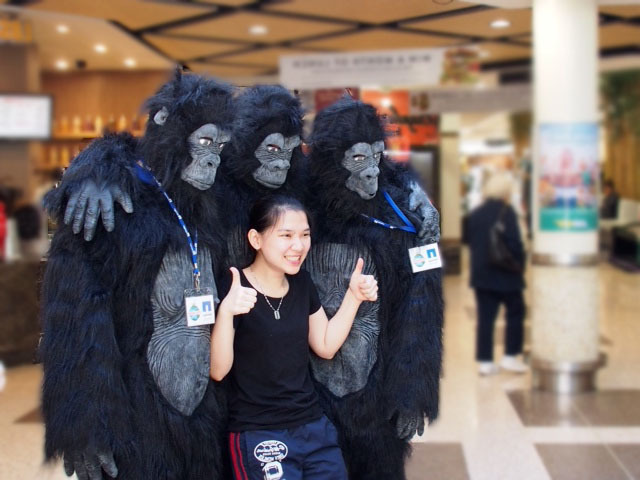 The guys at NetApp did exactly that when they promised their work mates if they hit their $1,000 target, team 'Gone Fishing' would head off and around Sydney in gorilla suits. All the teams wanted to raise funds for a great cause but were also keen to get as many people involved and up from behind their desks. Who doesn't want to see their Director walking around in a gorilla suit? On top of this challenge, the teams used Facebook, Twitter, Emails and had offered home baked cakes to get everyone excited. We asked Josh who captained the team, Super Henry! about how he achieved such fantastic results. What do you think got you to hit such a high fundraising amount? I made a commitment to shave my head once $9,000 was reached. It must have worked because I hit the fundraising target with a week to spare. Did you have any personal goals you wanted to achieve whether it be fundraising or fitness? To raise awareness with as many people as possible about the needs of children with cerebral palsy and the work being done by the Cerebral Palsy Society to assist these children. Do you have any fundraising tips for those participating in 2018? Firstly that technology is your friend. Use social media, the internet, telephone, email or whatever to tell as many people as possible about Steptember and your fundraising. It’s a very time efficient way to promote your efforts to family, friends, work colleagues and associates. Secondly, make your initial message to potential donors count. Tell them why you are doing Steptember and what their donation will mean for a child living with cerebral palsy. Thirdly, thank every donor for their contribution. Once again, technology can help here.